Oh, what an amazing day! 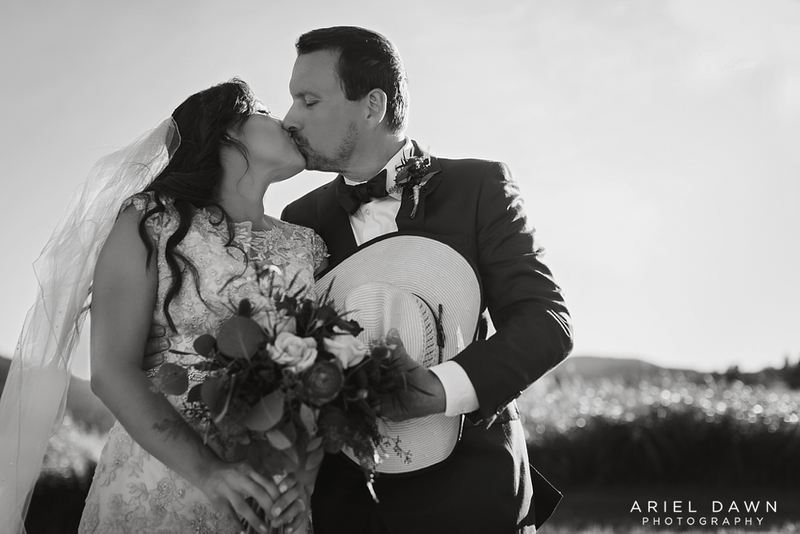 I have been loving all these winter elopements!!! It allows lots of extra time with just the bride and groom to get all these fun and unique photographs. Amber and Doug wanted to get out of LA, leave the big city behind to visit the mountains and experience what ranch life was like. 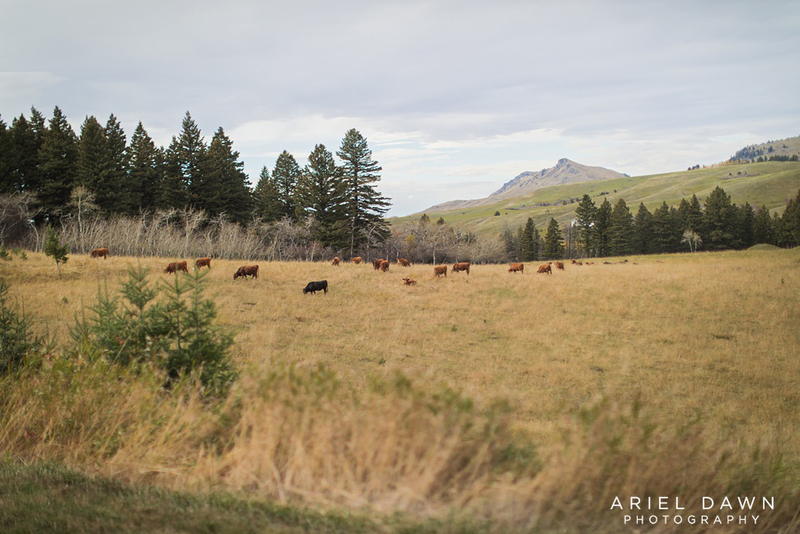 What better place to do that than Standford, Montana, at the Hughes Mountain Ranch. 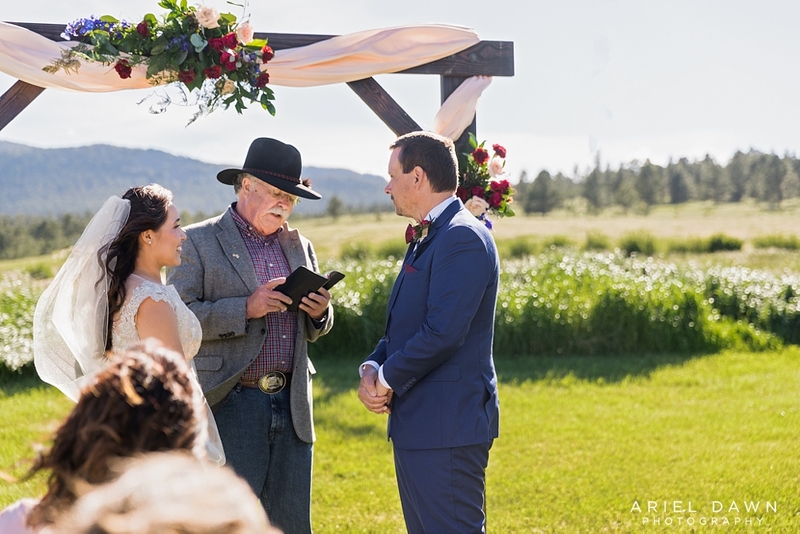 Over several visits, becoming dear friends of the Hughes', and falling in love with the "magic of the ranch" and "cowboy life," they decided to celebrate their wedding there with their families and a few close friends. 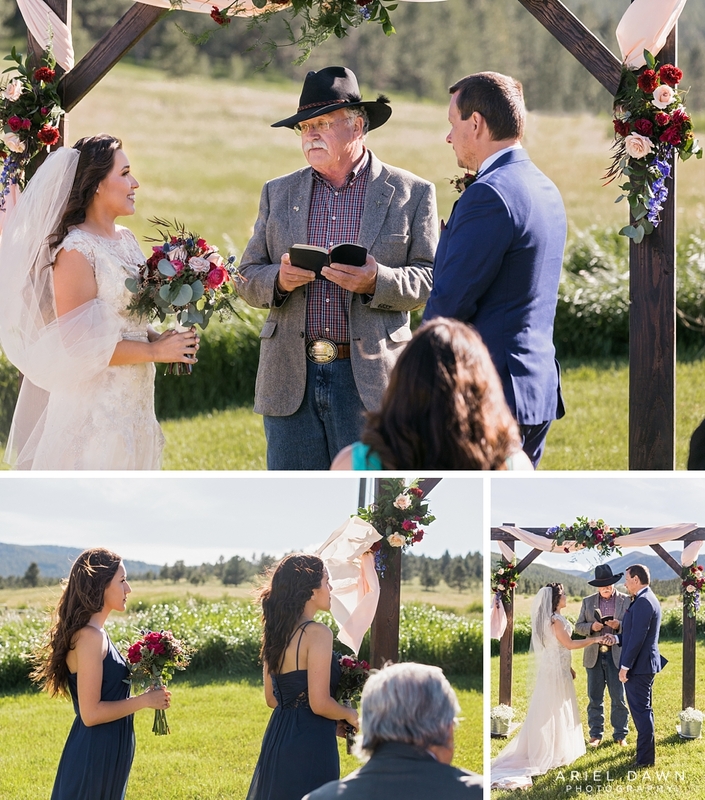 A beautiful small ceremony facing endless scenery of fields, trees, and mountains. I love the simple yet elegant decorations of flowers, wooden chairs, and arch. A beautiful June day to celebrate a wedding. 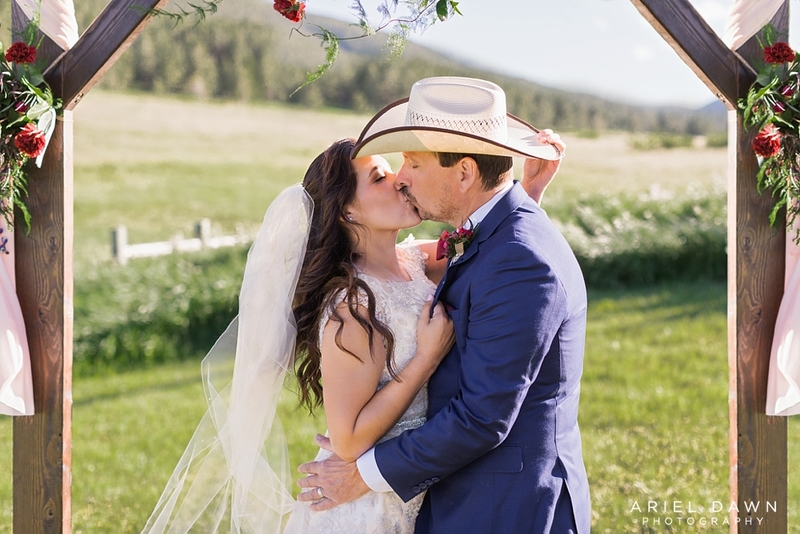 It's no wonder that Doug and Amber fell in love with Montana on their vacations from California! Doug was completely awestruck when he saw Amber for the first time in her wedding dress. 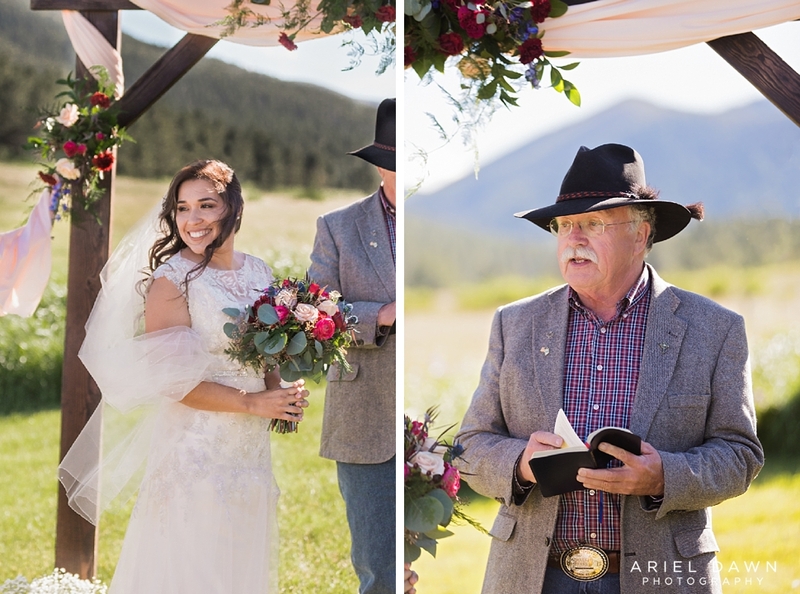 Amber's grandpa did the honor of walking his granddaughter down the aisle. Doug looked dashing in his blue groom suit and red bow tie. Amber's smile did not leave her face the entire wedding ceremony. You could tell she was in heaven. Amber's sisters and brother were the bridesmaids and groomsman. You could see teary eyes on some of them as they watch their sister get married to her soulmate. The bride and groom's first kiss as husband and wife. Both the bride and groom are in absolute bliss walking back down the aisle officially married. Amber and Doug brought their three dogs all the way from California for the grand celebration. 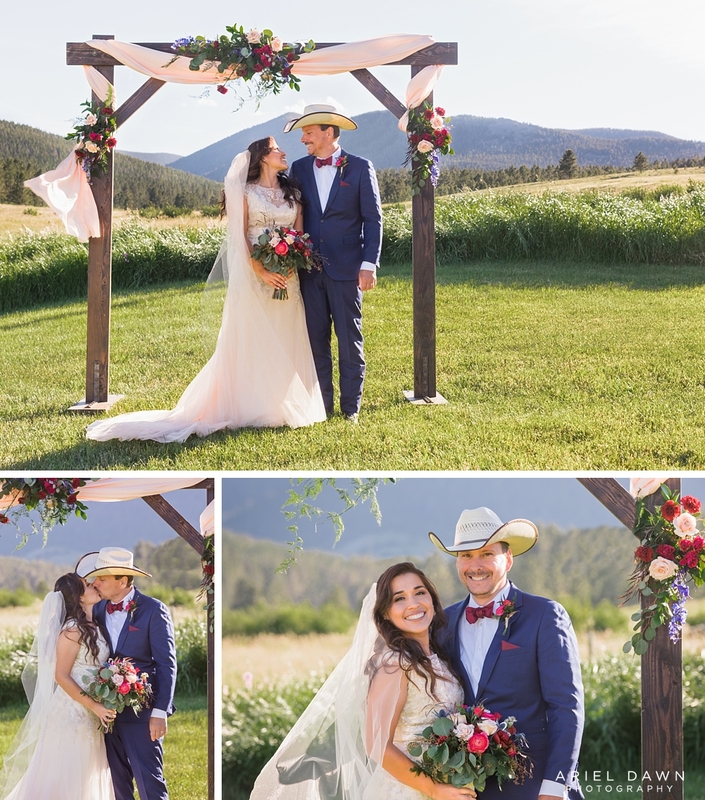 While the guests enjoyed cocktail hour, we went to the ceremony arch to capture a few more pictures with the picturesque Montana background. Doug embraced full Montana style and wore his cowboy hat for some of their photos. I didn't know which Amber enjoyed more, Doug wearing the hat or ripping the hat off his head to pull him in for a kiss. The reception appetizers were a beautiful array of meats, cheeses, and fruits. The best cake designers I've ever crossed paths, Crooked Tree Coffee and Cakes. They outdid themselves again by making this beautiful tree cake featuring carved heart and all. A delicious strawberry and almond salad is served before the main course. The dogs are enjoying the fresh Montana air and looked cute as ever in bowties. The bride's mom and the groom decide on which amazing food to add to their plate first. I was glad to have taken a few extra dog portraits of Frodo because he passed away a few months after the wedding. By far one of the best wedding vendor meals I have ever had. YUMMMM!!! Toasts continued throughout the receptions as all guests had only wonderful and lovely things to say about the bride and groom. One of my favorite images of the entire wedding group because everyone is smiling and having a joyous time. Time to cut the wedding cake! Wedding Coordinator, Elena, had this cutting knife made for Amber and Doug with their names engraved on it. Amber made the most beauitful Montana bride. 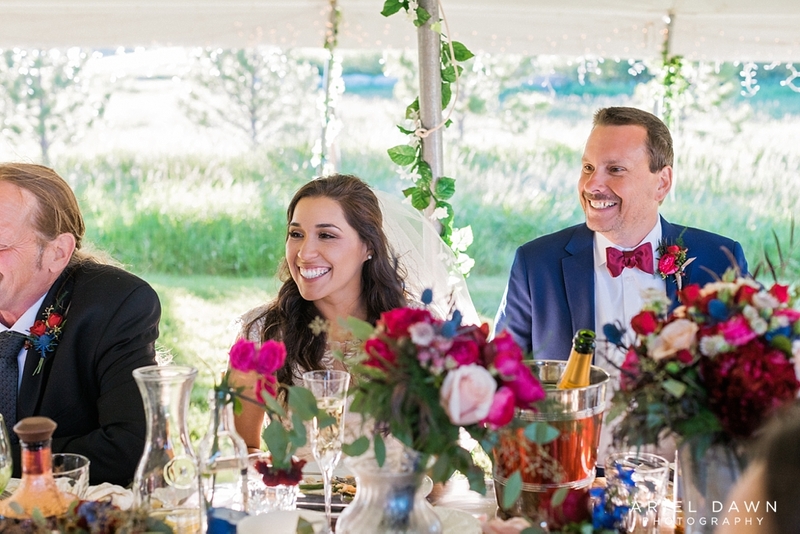 Macee and Matt Barton had a beautiful wedding ceremony at Arrowpeak Lodge in Montana near Great Falls where I used to live. It was a cool fall afternoon when I arrived at the lodge. Colors everywhere! Yellows, oranges, reds from the aspen trees, snowy blue mountains in the background and deep greens from the giant pines surrounding the entire venue. The groom and groomsmen's time getting ready was nothing but relaxing and filled with merriment of having a glass of whiskey and singing songs. Macee planned ahead and brought extra tissues for her and Matt's first look. It was beyond precious. Macee did a marvelous job thinking ahead and picking out marroon dresses for the bridesmaids and purple and red flowers for the bouquets to tie in with the October scenery. It was kind of fun having some wildlife in the distance to make you feel deep in the middle of nowhere. 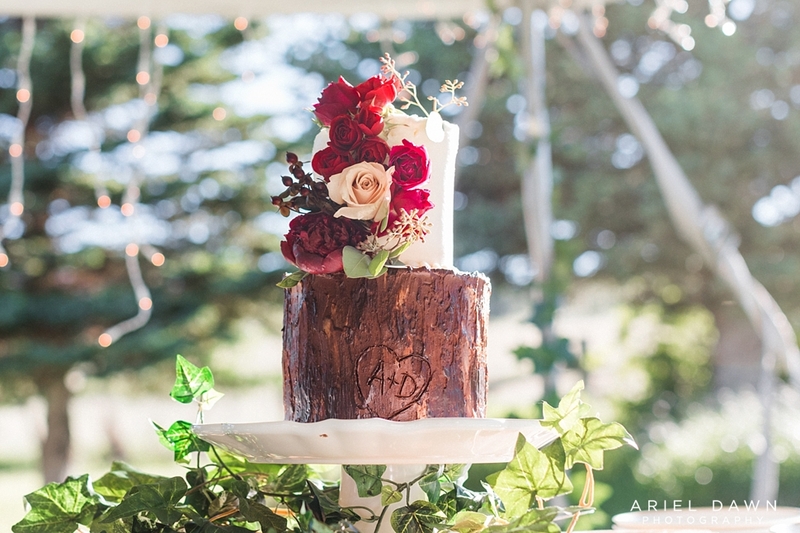 The maroon and reds from the wedding decorations that go so wonderful with all the lush green from the forest. Dad holding back tears as he walked his daughter down the aisle. Macee and Matthew's friend performed the wedding ceremony. I think having a friend or family member marry you is so much intimate and special for the couple. They couldn't have asked for a more beatuiful wedding day. 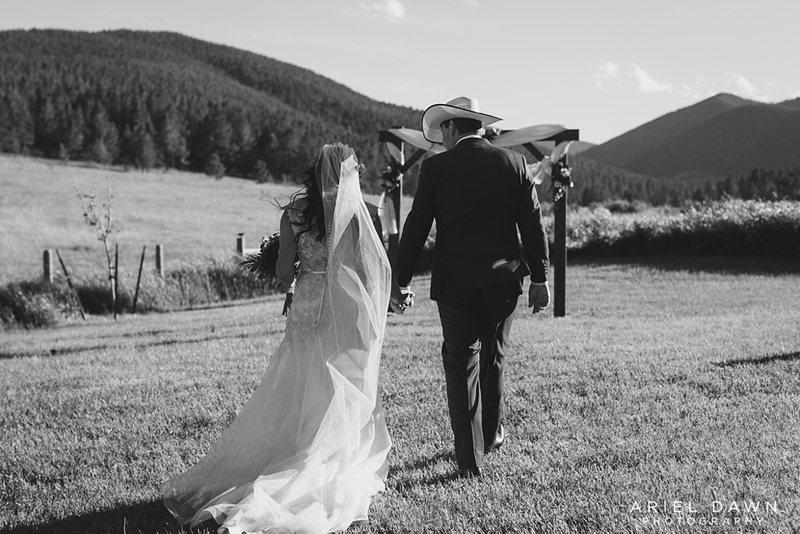 After the ceremony I took the bride and groom to some aspen trees, so they could share a moment alone together before the reception festivities started. The bride's mom and bridesmaids DIY'd the wedding bouquets! I think they did a stunning job. Macee and Matt enjoyed their first dance to a Lion King song. It was perfect! After things were winding down at the reception I stole the bride and groom away for some sunset photos. 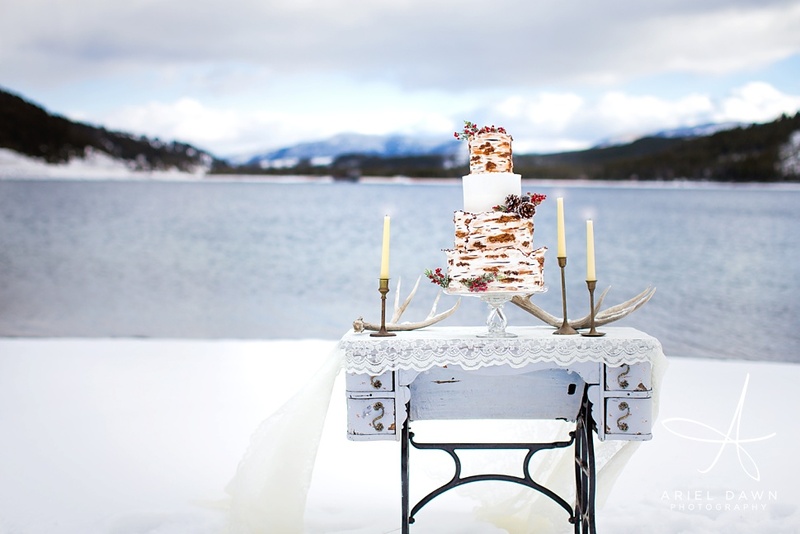 Crooked Tree Coffee and Cakes makes by far the best wedding cakes in Montana. It was so exciting to work with new vendor Rustique, who does rentals, planning, design. She carries the most amazing products from vintage candle sticks to rustic furnature. The beautiful and amazing Grand Union Hotel located in Fort Benton, Montana. The bride and her bridesmaids shared mimosas and got ready in these amazing floral bathrobes. 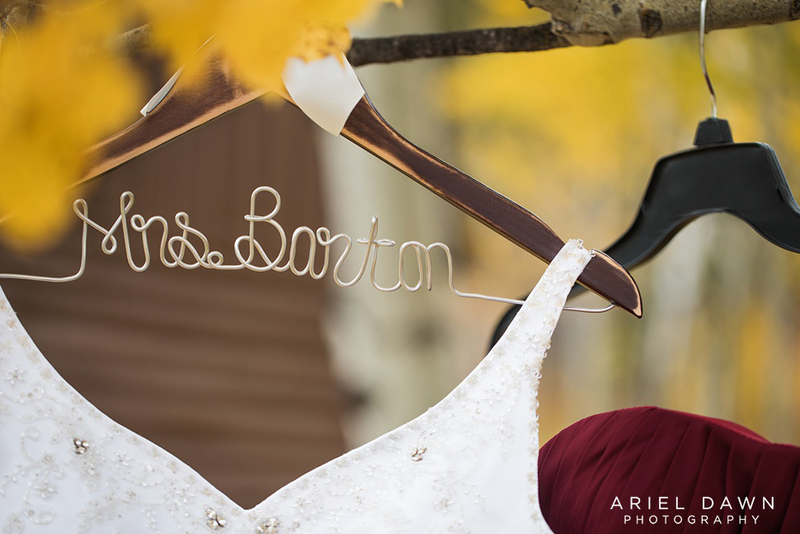 Fort Benton has the most amazing scenery to capture bride and groom photos. I was in love with the fur coat Carolyn wore to compliment her wedding dress. Matthew and Carolyn took a quick dip kiss before the wedding in near the Grand Union hotel. 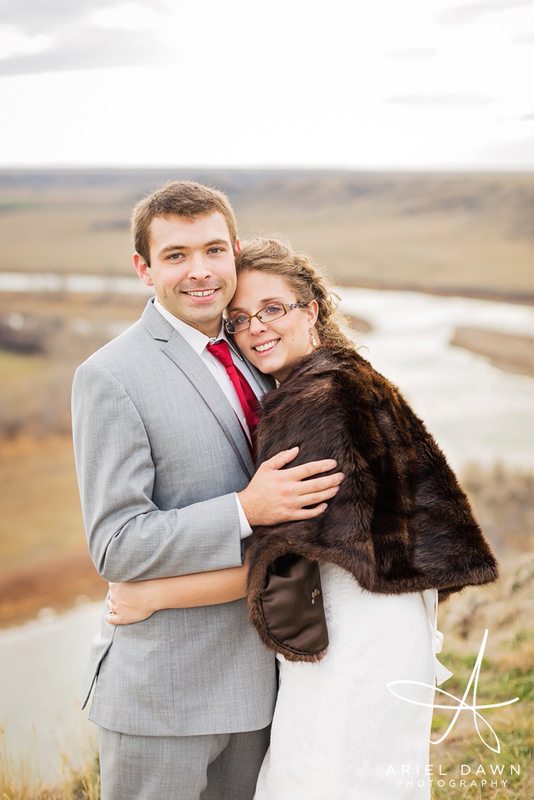 We had an amazing time taking family and bridal party photos on the bridge in Fort Benton, Montana. I think my friend Justin is surrounded by an aura of serendipity. Him and his beautiful new bride Jen met in the Air Force in Texas and it just so happens they are both from the far away land of Oregon. From then on they were stationed and worked together until they fell in love and never wanted to be apart. On top of that, Justin and I used to walk to school together growing up. It's wild we ended up in the same town all the way up in Montana. We all got enjoy the freshness of Oregon again though during their gorgeous wedding. At a resort by the Neal Creek we were surrounded by the valley's moss covered forest and recent rain scent. It was such a beautiful party! Justin, Jen, and I snuck off for a last minute photo session in the tall grass of Oregon's hills.